It is interesting to note that some studies suggest people who play wind instruments are less likely to suffer from the affects of asthma. Whether this is true or not, learning correct breathing techniques is helpful in many areas of life. Wind instrument players receive extra health benefits simply by learning to play their instrument. Very young children may find it challenging to play a normal sized flute simply because of its length. A flute with a curved head joint may be used for little ones with shorter arms. At about 9 or 10 years of age they may move onto the normal size head. Some flutes come with both heads so there is no need to purchase two flutes. The School Locker stocks the perfect flute for little people. For older children a student or beginner flute is a good choice. These are lighter and easier to play than professional flutes and will stand up to the knocks that they will probably receive. Aim to buy the best instrument you can afford which is silver-plated with closed holes, E mechanism (sometimes called a split E) and a C foot joint. Some beginner flutes are upgradable by replacing the head joint with a hand made silver head joint. Flutes, unlike cars, often retain their purchase value so the investment in a good quality, versatile instrument is wise. 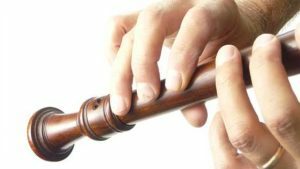 Lets celebrate the humble recorder! To play this wonderful, traditional instrument correctly takes a lot of hard work. To play it poorly is relatively easy, however it has many advantages over other instruments for the young child. Foremost it allows a very young child to begin playing on a wind instrument instead of waiting until 8 or 9 years of age when his arms are longer. Correct breathing techniques are learnt which is beneficial. The recorders are tough, nearly unbreakable, small, light weight, transportable and affordable. The recorder should not be viewed as a “starter instrument” before going on to flute in the same way that the ukulele should not be viewed as a “starter instrument” before going on to the guitar. Both the recorder and the ukulele are complete instruments in and of themselves and actually take a lot of practice and talent to master. All Flute/recorder lessons include rhythm taught separately on percussion or drums. Children who have been through the Early Learning Music program will easily transition to flute or recorder. Lessons include playing along with various CD tracks, playing duets, playing along with percussion. A range of method books are used at Music Matters including Hal Leonard, Alfred and the Progressive Series. Students are also welcome to bring their own books to lesson. Theory lessons are an integral part of flute and recorder tuition.